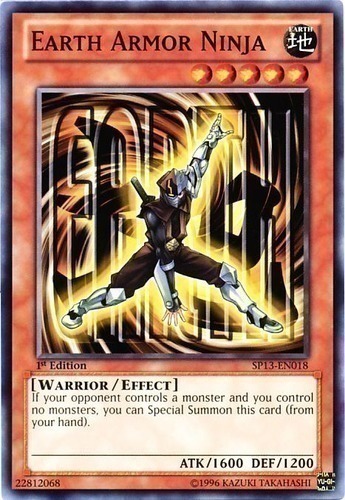 All face-up Psychic-Type monsters you controlled when this card was activated gain 300 ATK for each of your Psychic-Type monsters that is removed from play when this card resolves. 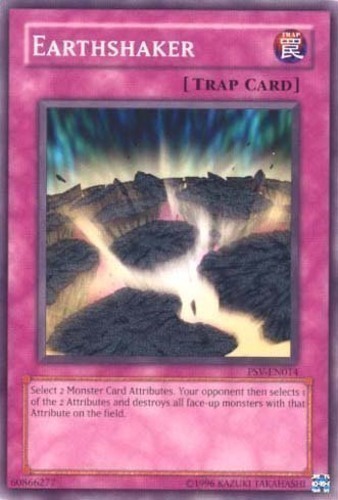 During the End Phase, remove from play all monsters that were affected by this effect. 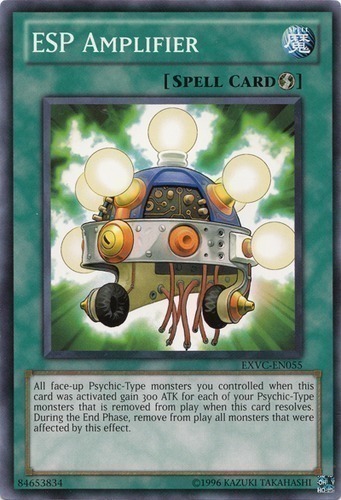 If your opponent controls 2 or more monsters, you can Normal Summon this card without Tributing. 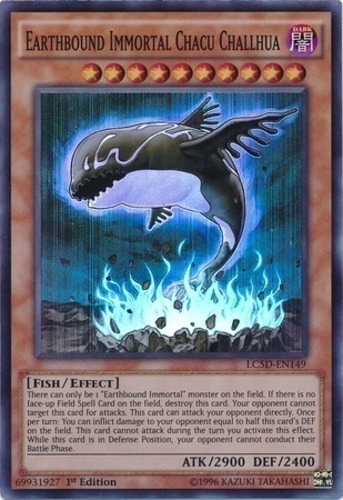 If you control "Panther Shark", you can Special Summon this card (from your hand). You can only control 1 "Eagle Shark". 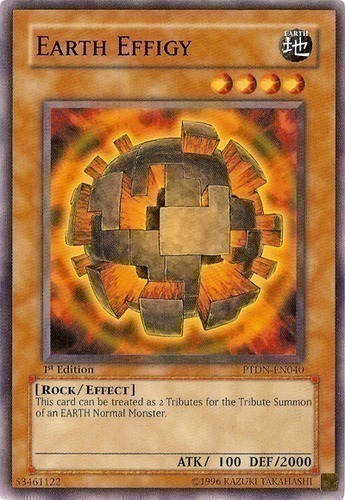 This card can be treated as 2 Tributes for the Tribute Summon of an EARTH Normal Monster. There can only be 1 "Earthbound Immortal" monster on the field. 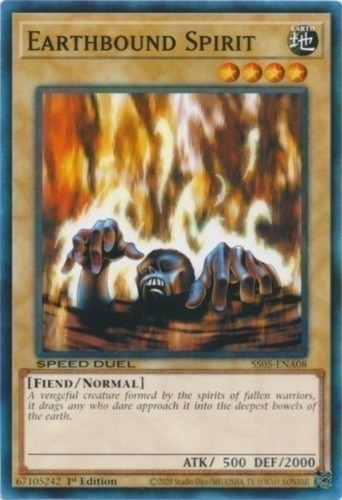 If there is no face-up Field Spell Card on the field, destroy this card. Your opponent cannot target this card for attacks. This card can attack your opponent directly. 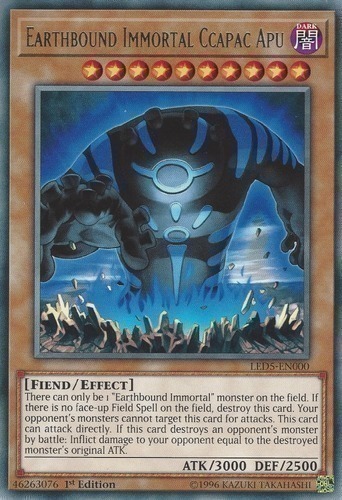 When this face-up card leaves the field, except by its own effect: Destroy as many face-up monsters your opponent controls as possible, and if you do, inflict 800 damage to your opponent for each monster destroyed. There can only be 1 "Earthbound Immortal" monster on the field. 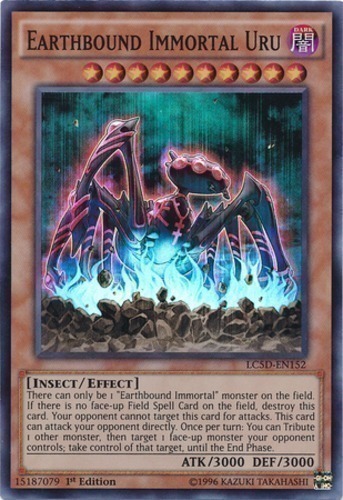 If there is no face-up Field Spell Card on the field, destroy this card. Your opponent cannot target this card for attacks. This card can attack your opponent directly. 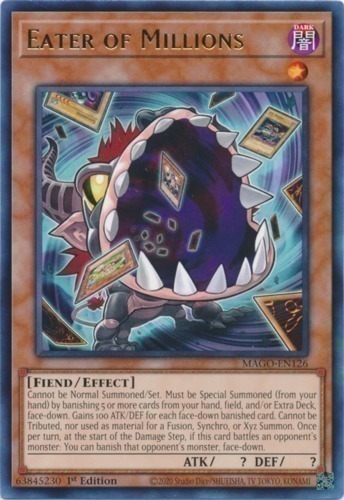 If this card destroys an opponent's monster by battle: Inflict damage to your opponent equal to the destroyed monster's original ATK. There can only be 1 "Earthbound Immortal" monster on the field. 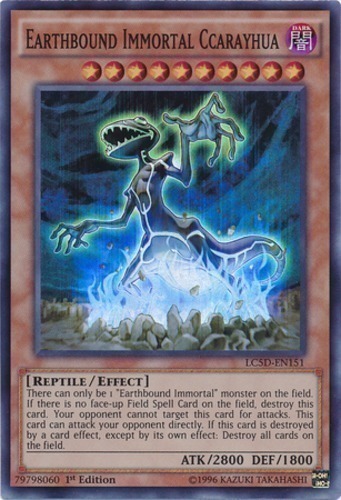 If there is no face-up Field Spell Card on the field, destroy this card. Your opponent cannot target this card for attacks. This card can attack your opponent directly. Once per turn: You can inflict damage to your opponent equal to half this card's DEF. This card cannot attack during the turn you activate this effect. 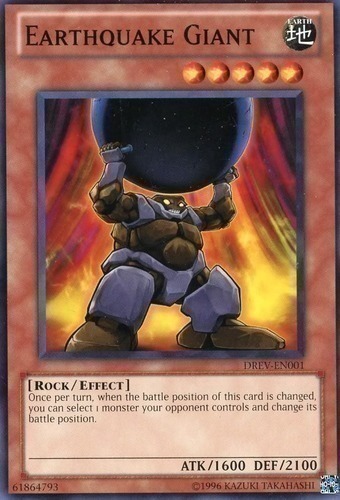 While this card is in Defense Position, your opponent cannot conduct their Battle Phase. There can only be 1 "Earthbound Immortal" monster on the field. 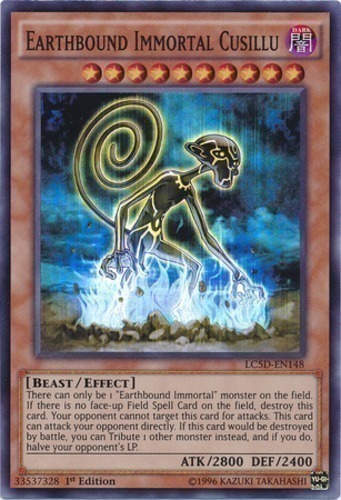 If there is no face-up Field Spell Card on the field, destroy this card. Your opponent cannot target this card for attacks. This card can attack your opponent directly. 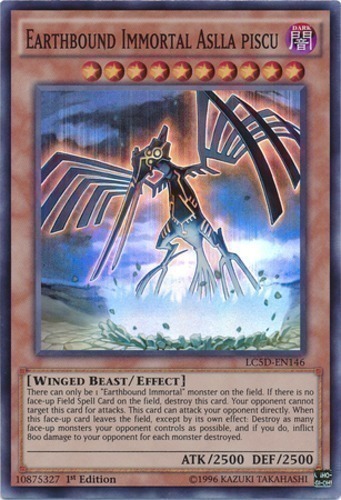 If this card would be destroyed by battle, you can Tribute 1 other monster instead, and if you do, halve your opponent's LP. There can only be 1 "Earthbound Immortal" monster on the field. 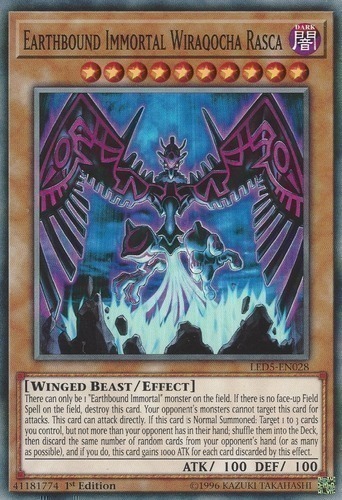 If there is no face-up Field Spell Card on the field, destroy this card. Your opponent cannot target this card for attacks. This card can attack your opponent directly. 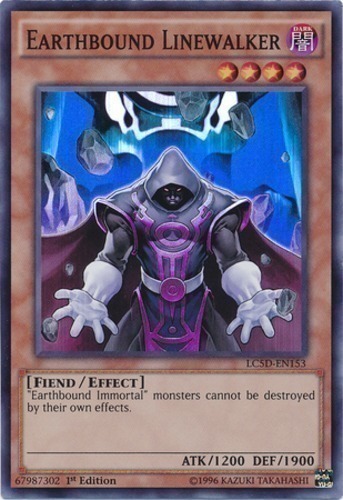 Once per turn: You can Tribute 1 other monster, then target 1 face-up monster your opponent controls; take control of that target, until the End Phase. There can only be 1 "Earthbound Immortal" monster on the field. 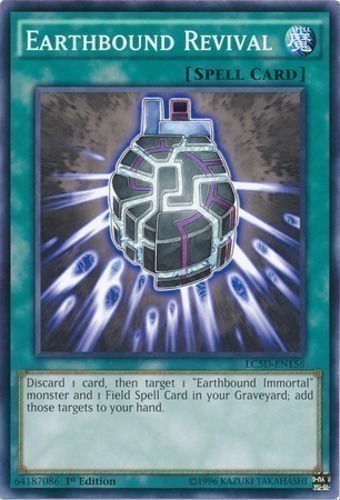 If there is no face-up Field Spell Card on the field, destroy this card. Your opponent cannot target this card for attacks. This card can attack your opponent directly. 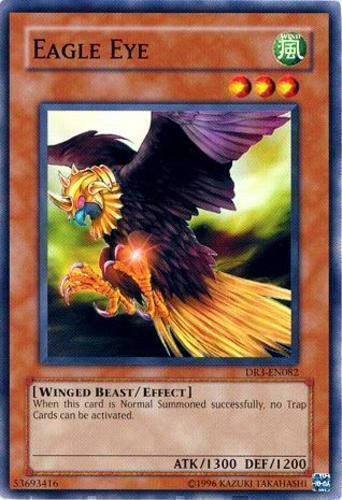 If this card is Normal Summoned: Target up to 3 cards you control, except this card; shuffle those targets into your Deck, then discard as many random cards from your opponent's hand as possible, but not more than the number of returned cards, and if you do, this card gains 1000 ATK for each card discarded by this effect. "Earthbound Immortal" monsters cannot be destroyed by their own effects. Discard 1 card, then target 1 "Earthbound Immortal" monster and 1 Field Spell Card in your Graveyard; add those targets to your hand. 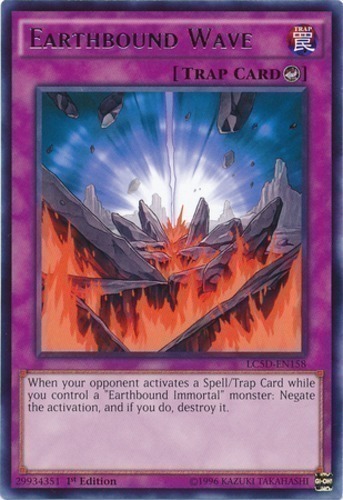 When your opponent activates a Spell/Trap Card while you control a "Earthbound Immortal" monster: Negate the activation, and if you do, destroy it. 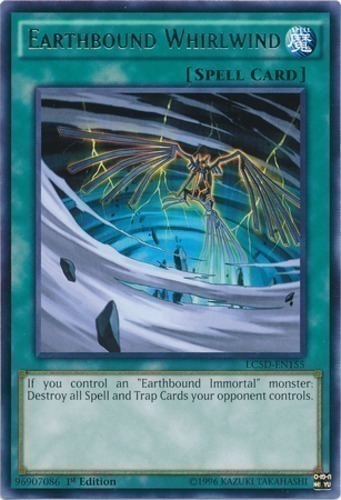 If you control an "Earthbound Immortal" monster: Destroy all Spell and Trap Cards your opponent controls. Change all face-up monsters on the field to Defense Position. 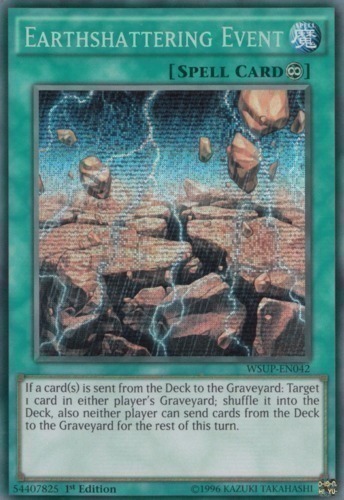 If a card(s) is sent from the Deck to the Graveyard: Target 1 card in either player's Graveyard; shuffle it into the Deck, also neither player can send cards from the Deck to the Graveyard for the rest of this turn. Cannot be Normal Summoned/Set. 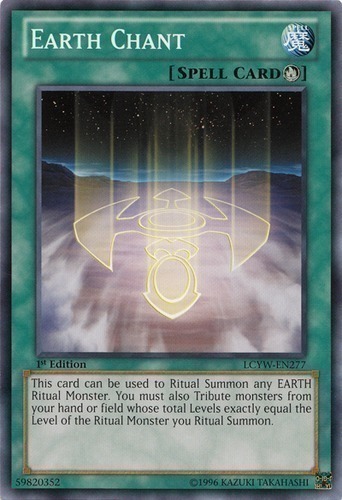 Must be Special Summoned (from your hand) by banishing 5 or more cards from your hand, field, and/or Extra Deck, face-down. 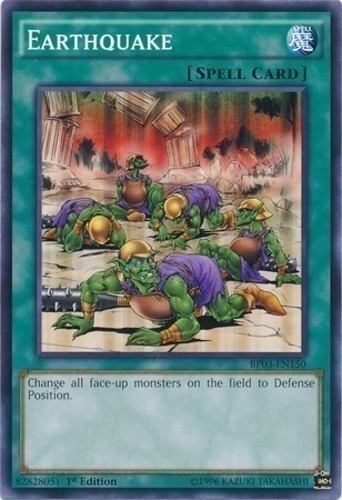 This card gains 100 ATK/DEF for each face-down banished card. 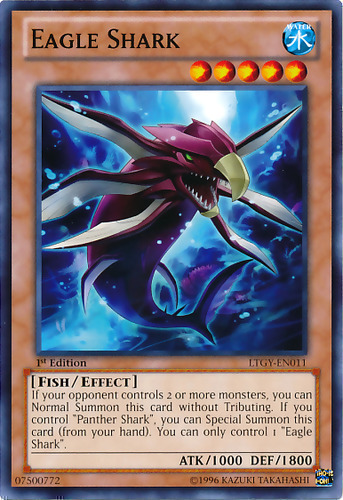 This card cannot be Tributed, nor used as material for a Fusion, Synchro, or Xyz Summon. 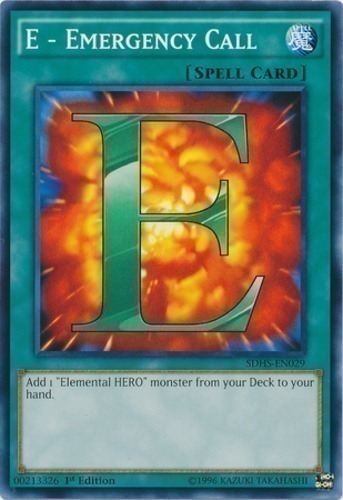 Once per turn, at the start of the Damage Step, if this card battles an opponent's monster: You can banish that opponent's monster, face-down. 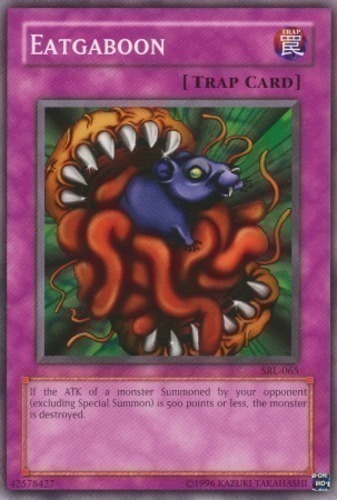 If the ATK of a monster summoned by your opponent (excluding Special Summon) is 500 points or less, the monster is destroyed.